When I was in Singapore recently, I craved for a coffee after a very heavy meal in a hawker place. 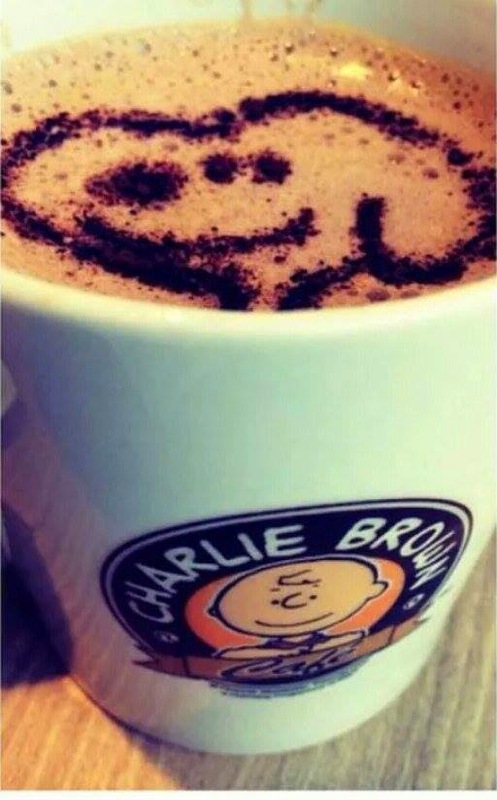 As most friends would know, I am a coffee addict, so when we're heading to Somerset to meet my friend, my sister in law suggested that we try Charlie Brown Café in the Cathay Cineleisure Orchard. I was hesitant at first since coffee for me is equal to Starbucks only (Yes, I am a Starbucks fanatic). So for the sake of trying another coffee shop, we went to the Charlie Brown Café. It is 11pm already, but there are still a lot of people in the café. (Take note: If you are in another place and you see locals hanging and eating there, it means this place serves good food). The place is jammed pack with people, that is why we waited a couple of minutes before we had our table. While waiting, we took the chance to have photo ops with Snoopy and Charlie Brown at the front. The ambiance is cozy and it is filled with childhood nostalgia for me since I grew up watching Charlie Brown and the Peanuts before. They are not as popular as Mickey Mouse for Filipino children, but still, they are one of the pillars of my childhood TV moments. So after waiting for a few minutes, a Filipino server shows us to our seats. As we checked the menu, I thought this is really a very neat place to dine, have coffee and just catch up with friends or even just being alone reading a book. Charlie Brown café offers a lot of variations in their menu. 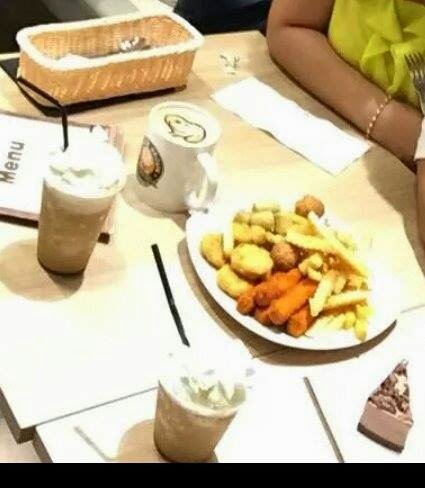 There are hot and cold beverages like coffee, tea, hot chocolate, fruit slush, frappes and fruit drinks. You can also order delicious vegetable salads as well as pancakes with pretty pictures of Sally, Linus, Schroeder and Lucy of the Peanuts paired with different fruits. If you love crepes, they also have their signature crepes with the face of Snoopy, Woodstock and Charlie Brown in it – a pretty unique way to amplify the beauty of the plate. If you are a sandwich or a burger person, then rest assured, you will be amazed by their list of sumptuous burgers and sandwiches. There are lots of variety to choose from. So since we are 4 in a group, we decided to order their Charlie’s combo consisting of a platter of fries, fish fingers, chicken bites, chicken chipolatas and chicken balls. Me and my friend ordered the frappe cafe caramel while my sister in law and brother ordered their hot latte. We also tried their daily baked pastries of Snoopy’s lava cake and their Oreo Cheesecake. All in all, it was a great meal while catching up with my friend and my family. My brother paid $57 SGD and it is indeed okay for a Singapore meal of four. 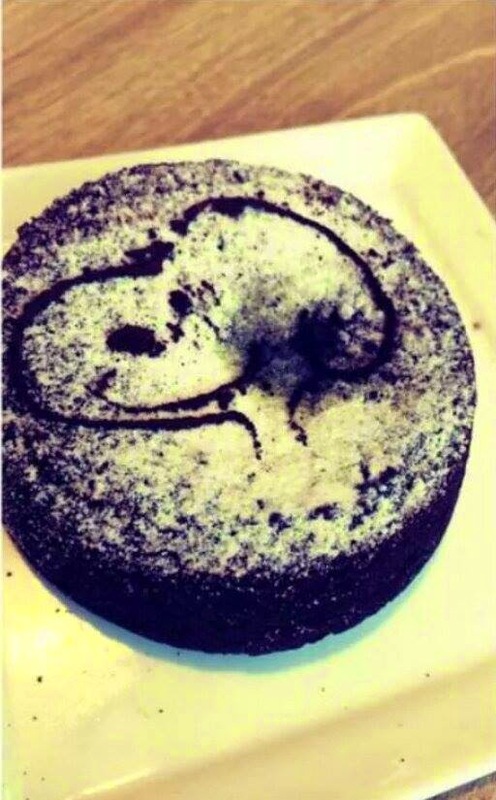 Their famous Snoopy's Lava Cake. As you break the cake in half, a creamy chocolate ganache oozes magnificently in the middle. So when in Singapore, or even Hong Kong visit Charlie Brown Café. You will definitely fall in love with it. Charlie Brown Cafe looks interesting. I'm taking note of this as reference for my next travel to Singapore. Relyn Leorente -- Thank you i've found you! Thanks for sharing your Blogs....Biiggg Heellpp!! !